Some points in the article were further clarified on Dec 28. Stomper Eric was shocked when he realised his car was taken for a joyride by a young man while he was in Malaysia. Before leaving for Penang, Eric left his car at Glozz Factory Mobile Car Grooming Services on Nov 3 to be spray painted and for an internal grooming job. The trouble came when he was back from his trip five days later on Nov 8. He checked his odometer and it read a total of 661.6 kilometres when he came back, compared to the 388.5 kilometres clocked before he left for Malaysia. That is an additional distance of about 272 kilometres. He said: "I don't see how 272 kilometres could have been clocked. That's impossible." 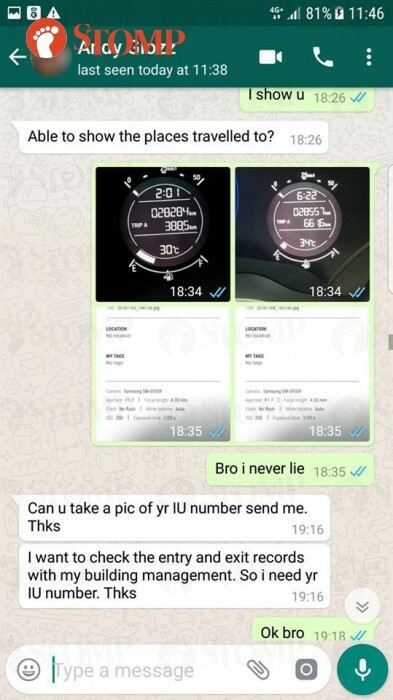 He then sent a message and pictures of his odometer via WhatsApp to Andy Goh, the owner of the Glozz Factory. He told Stomp: "I sent pictures of my odometer to Andy and he didn't know what had happened. "He had to check the records of the car entering and leaving the building. "Later on, he told me that Shawn, the son of the owner of another workshop, had taken my car and driven it to Malaysia." Shawn is the son of William Chng, the owner of Chng Brothers Motor Services. Eric said that he found many things in his car that were out of place too. He said that the SD card that was in his in-car camera was not in its original place. Andy also told Eric that when he was grooming his car, it had cigarette ash in it. Following the incident, Eric lodged a police report on Nov 9. In response to a Stomp query, the police said: "The police confirm that a report was lodged and investigations are ongoing." Andy initiated a meet up with Eric and the Chngs on the same day. During the meetup, Shawn admitted that he had indeed driven the car overseas. Shawn had also reportedly admitted that he smoked in the car, which was why there were cigarette ashes in the car. Andy then told Eric to settle the matter with William privately instead. 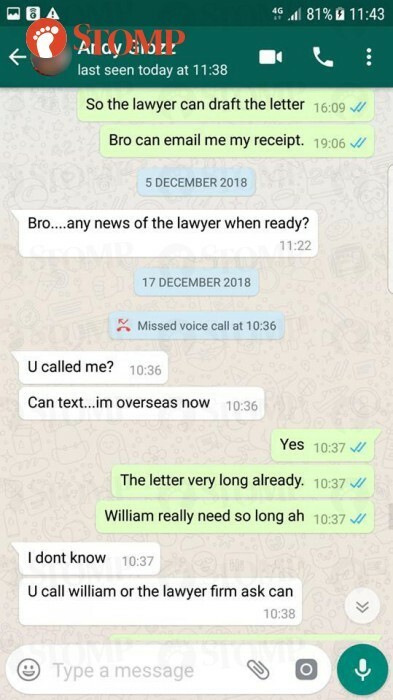 On Dec 6, Eric reached out to William to check on the progress of the private settlement. 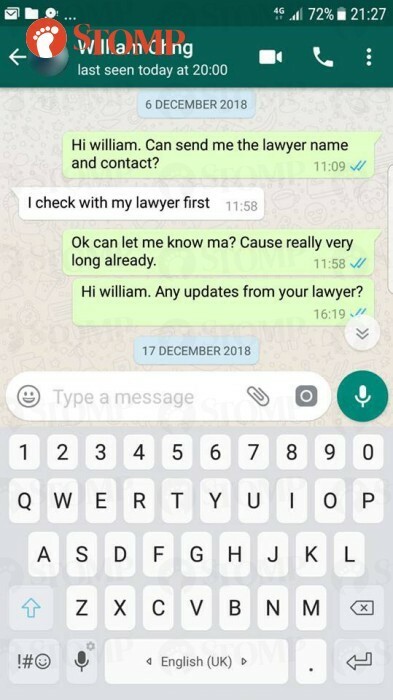 He texted once and received a reply from William, who said he would check with his lawyer before responding. A few hours later, Eric texted William again to ask for an update. However, there was no reply. 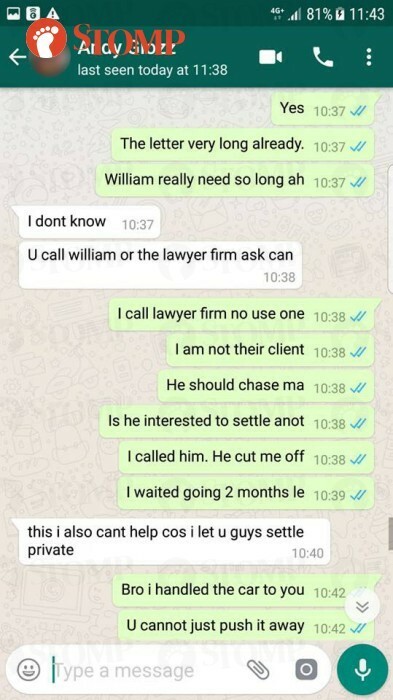 On Dec 17, the private settlement letter from William's lawyer was still not prepared. 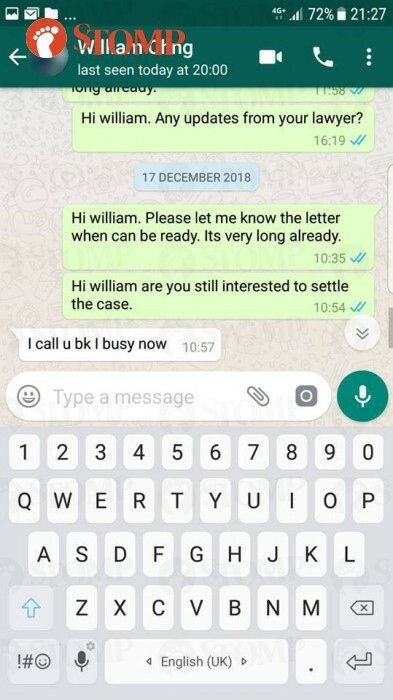 He contacted both Andy and William for updates. He messaged Andy, who directed him back to William. When he contacted William, William said that he was busy and would call Eric back. Eric told Stomp: "Andy compensated me the amount, which William had agreed on. He compensated me on behalf of William." Eric posted a recount of the incident on Facebook on Dec 23, which was shared by Facebook page SG Road Vigilante. Glozz Factory then posted a public apology on their Facebook page on Dec 24. Andy clarified in the post that Shawn Chng was from Chng Brothers Motor Services. He said that Shawn had taken Eric's car without permission after sneaking into Glozz Factory. Andy further said that Glozz Factory compensated Eric to "expedite the settlement", as William did not so contrary to their initial agreement. Andy apologised and thanked Eric on behalf of Glozz Factory. View the gallery for more screenshots of the conversations.